The Lozier story begins in 1937 in Omaha, Nebraska, where A. Gordon Lozier started a small refrigerator repair service out of his garage. He soon saw an opportunity to expand the business and began manufacturing his own brand of refrigeration systems for small general grocery stores. Gordon’s wife Emma served as bookkeeper and purchasing agent, spending more time with the business as it grew. 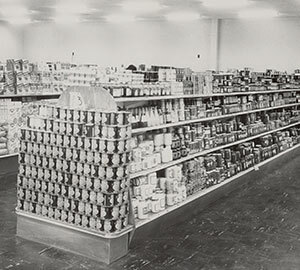 By the 1950s, the grocery industry had begun to change with innovations in food production and packaging. With a wider variety of products to sell, stores started increasing the size of their sales floors and moving to a self-service format for shoppers. Gordon and Emma’s son Allan, who officially joined the company in 1951, saw the need for a better merchandising solution. He is credited with designing a display shelving system that was structurally sound and more versatile than anything else on the market. 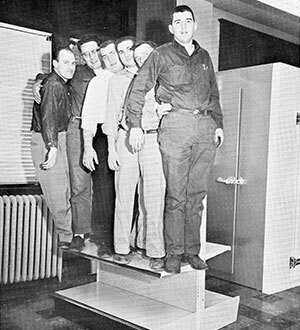 The new shelving caught on among grocers, and in 1955 Lozier switched to only manufacturing display shelving. 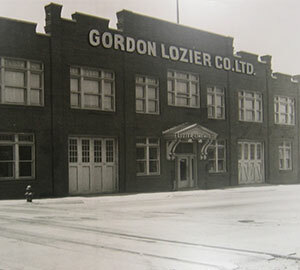 In 1956, the company was officially established as Gordon Lozier, Inc., operating out of a 20,000 square foot facility with 25 employees. Allan Lozier was named president in 1959 at the age of 26. The company was renamed Lozier-Line Manufacturing Company in 1960, marking the beginning of a period of successful growth for both Lozier and the retail industry. Chain, discount, and department stores spread throughout cities and suburbs. Allan’s strong work ethic and drive to continuously improve Lozier’s products proved to be the attitude needed to keep up with the industry as it evolved. Under his leadership, the company began expanding capacity by building and purchasing additional manufacturing and distribution facilities in Omaha and across the U.S. The company officially became Lozier Corporation, the name we are known by today. Lozier has played an active role as the retail industry has grown and changed. Partnering with our customers, Lozier helped develop such retail markets as automotive parts, catalog showrooms, mass retailers, office, computers, pets, hardware, sporting goods, superstores, drugstores and more. Today, we serve customers in a broad range of industries, designing and building a wide variety of store fixtures that go far beyond those first grocery store shelves. Our employee base has grown to over 2,200 people nationwide, with seven manufacturing and distribution facilities plus a robust import program. Through innovations in our product line and expanded capabilities in manufacturing and distribution, Lozier continues to expand into new markets and grow our business, just like Allan set out to do from the very beginning. Brick-and-mortar retailers are looking for more creative, flexible merchandising solutions than ever before as they compete with a host of ecommerce options. Lozier’s team works with customers daily to develop fixtures that meet these changing needs while still maintaining the quality, durability, and flexibility the company has always been known for. In 2014, Lozier acquired key assets of Leggett & Platt Store Fixtures Group. This allowed us to expand our capacity and distribution and to provide a wider variety of fixture solutions for our customers, including specialty wood fixtures. After an extensive business review, Lozier refocused the company’s resources on our key product lines, exiting the custom wood business but retaining a strong import program and supporting our expanded metal production capacity. That’s what we do. However, as much as we’ve changed along with our customers, our core values and our work ethic remain the same as our namesake.